Myst, the solitary, quiet adventure game that was packed with so many PCs in the 90s, is a divisive game. Personally, I’ve always been a fan of the series. I was one of those people who bought The Book of Atrus in hardcover. I even played through the sequel, Riven, as a kid, though I can’t say I did it without some help. When I saw that a spiritual successor to this series was put up on Kickstarter, I backed, so that I would be sure to have the game when it released. I hate to boast, but I have yet to back a total dud on Kickstarter. I loved Obduction. But it’s hard to talk about why I loved it without spoiling the experience. On the other hand, it’s very easy to talk about the things that I didn’t love. This may look like a negative review in the text as a result, but I’m going to cap it with a thumbs-up, just so you’re aware. I’m also going to try to avoid all but the barest of spoilers, though there may be some, depending on your definition of a spoiler. 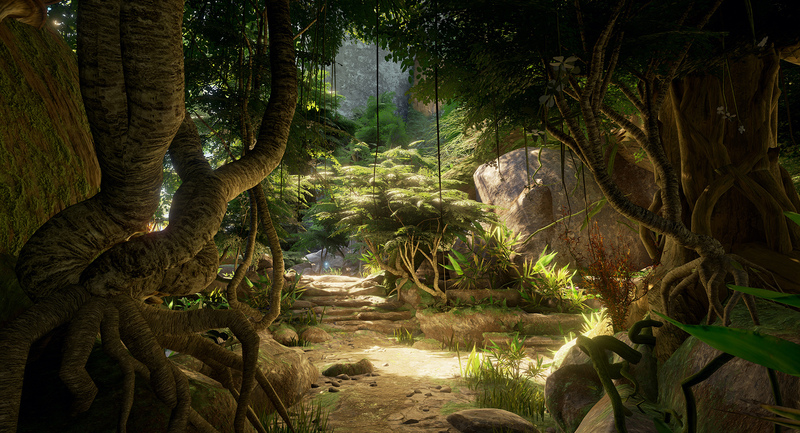 My first impression of Obduction involved realizing that it took a much higher end PC than I had anticipated. I tried playing it on my laptop at first, hoping for something quiet I could do on the plane, but the game asked more of my hardware than I realized it would and made that idea impractical. 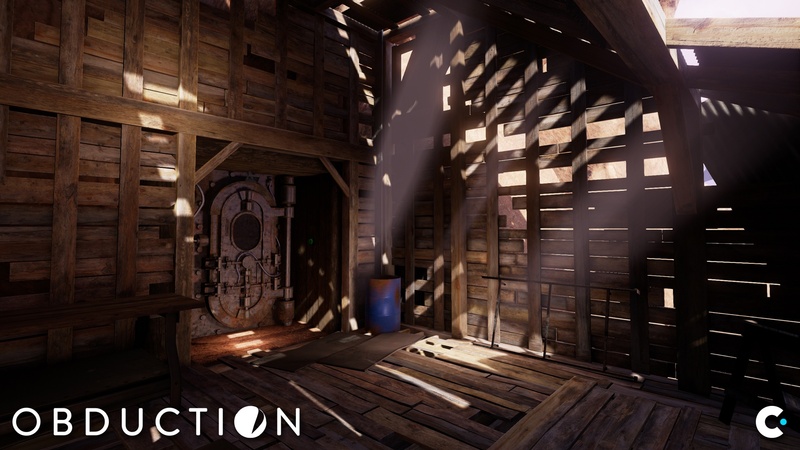 Obduction is an Unreal engine game, and it uses high end graphics to make its alien worlds seem real. It has Oculus Rift support as well, so this is something truly special, though I played the game mostly on my PC monitor. Even without Rift, the game … well, it makes me sick to my stomach. No way to sugar-coat that. I have a motion sickness issue, which I have discussed previously, and it’s at its worst when I get into a first-person game that has no gun in it. Obduction already has a crosshair, which activates when I need to look around to click on something, but the crosshair disappears when I’m in motion. This is when I need it the most. This is disappointing because if there was an “always-on crosshair” option in the menus, which to me seems like a pretty easy thing to add, I’d have had an easier time getting into the game. I understand the choice to turn off the crosshair for immersion reasons, but, developers: I need the crosshair. I mitigated this problem by switching the game to “point and click/instant” mode, which limits the camera shake. It basically turns the game from a game where I amble around this world to one where I teleport around in little bursts, like Nightcrawler. Ultimately, though, the point-and-click mode felt kind of limited, and I sucked it up and switched back to free roam. Halfway through my experience, a new patch introduced a show-stopping bug that forced me to start the game all the way over from the beginning. I went through the stages of grief here: first hoping that there would be some way to continue after all, then getting pissed off at the developers, then, going to the game’s Reddit looking for answers, feeling despair, and at last resigning myself to retrace my previous steps at high speed to get back to roughly where I left off. There was a small comfort. While getting to the point where I was stuck initially had taken me ten hours of exploration, actually returning to that same spot took only about half an hour. The game is just that heavy on puzzle solving. In spite of these major problems, I was still determined to play this one to the end. It was worth it. The high end graphics actually make a big difference. Even if walking through them hurt a little at times, I put up with the pain because the worlds in the game are so beautiful and arresting. 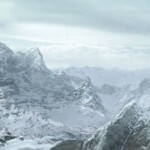 I say “worlds”: there’s more than one zone in this game, much like in Myst, but I don’t want to go into too many details. The first time I found a transition point to a new world was a breathtaking moment I don’t want to ruin for you by over-explaining. The world design has an air of mystery and beautiful lighting effects. The game’s ambient soundtrack adds to the weight of new discoveries, as well: dramatic and moving without being too obtrusive. Also like in Myst, the worlds of Obduction are mostly solitary experiences, with very little human contact. What human contact one does have is often through recorded live video. I thought this was a remarkably oldschool touch. It’s fun to see live action FMV coming back. However, there’s a sort of awkwardness too, in that for part of the game I’m supposedly interacting with a live person, but I’m a mute protagonist. Someone is barking orders at me, but I, otherwise supposedly a normal person, can’t speak back or interact. This is not how a real conversation would go! But that’s video games for you. I think the conceit is that I can hear the other character, but he can’t hear me, but this could be made a little clearer. Kickstarter’s fingerprints do not smudge the glass in Obduction as much as in some other games. Little bits of debris scattered throughout the game are put in as rewards for high level backers, who were allowed to add items of their choice into the environment. This works with the game’s story, and can be frequently charming. Here’s a photo montage of a beloved dog, preserved digitally. Here’s someone’s fanart hanging on a wall as an in-game painting. Here’s a random vase: it doesn’t seem to have any significance, but it must mean something to the person who put it there. These objects are all clearly labeled as Kickstarter reward objects so that they aren’t confused for red herrings… Well, except for the fire truck? I still don’t understand the purpose of the fire truck. The bigger problem with Kickstarter here isn’t the backer rewards, which were honestly pretty well-done, but the way that the crowdfunded money runs out in Obduction and makes the end of the game feel rushed. This impacts the game’s structure, which is already a little… off somehow. The game “clicked” for me at one point, and after about fifteen hours of just dicking around, I realized the actual goal I needed to accomplish. Then, wham, bam, I solved it all in one night. As a result, my Steam achievements look kind of funny: one here, one there, and then weeks later, nine all in a row. I think I just brute forced a few of the puzzles, to be fair. The trickiest part of Obduction is less the bits that are clearly puzzles, and more just getting lost, which is going to happen to you a lot at first because of how these alien worlds are set up and the learning curve required to understand how you’re navigating them. I got seriously cussing-at-the-screen lost, at a few points. This can be mitigated a little by taking in-game screenshots with a photo system. I just…. kept forgetting to do this, which is really my fault. If you end up playing the game, don’t forget about this like I did, and manual notes and sketches will also help a good deal. But even with all those caveats about how some issues may have been results of my personal play pattern, it’s obvious that there was an intended third act of Obduction that’s missing in the final product. 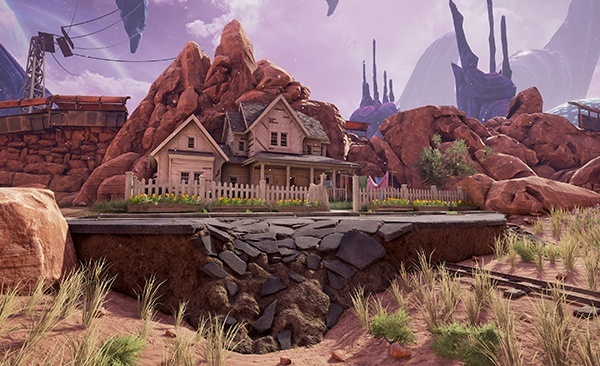 Obduction is still being patched, so it’s possible that some of the rough edges will be fixed in the future. The pacing problem is baked in, however. I’m curious to know, if anyone else plays it, if they also experience such a whizz-bang rush and screeching halt at the end. If you have not checked it out yet, I definitely recommend it for adventure game lovers, or anyone who likes exploring a beautiful mystery. Bring some Dramamine when you go, just in case you need it. Myst — rather, the graphics on the Myst box — was probably the principal reason (other than DOOM) that I chose to buy my first PC in 1994. I’d just never seen anything like it. MrLipid and I were discussing this the other day; the way new things seem new now and then age, and how it’s easy enough to find plenty of games to play that don’t require a new graphics card. Myst actually came up, and then we suddenly realized what you needed to play Myst back then — a CD-ROM drive, for one, which at $200-$400 was a large investment in and of itself. The cutting edge, as we know, is always moving. Looking at those Obduction screens above, it’s clear where the game’s horsepower requirements come from. Absence of something as simple as “always show crosshair,” though, is a pretty frustrating shortcoming, especially if the game makes you sick without one. Overall it looks very much like a Myst-ish game, which makes sense. While I tend to personally lose interest in puzzle-driven adventures quickly (I never actually played much Myst back in the day) this one looks so intriguing and beautiful it seems like it might be worth attention. Thanks AJ! Wow, that sure looks pretty. I only heard of this for the first time around release and didn’t realise it was a Myst-like. I never did play Myst for some reason, and I think it’s something my mum would have loved playing with us as kids back in the day; she used to get a real kick out of exploring these strange and often beautiful alien worlds. This sounds like something I’d enjoy, particularly with my girlfriend. Even though these kinds of games aren’t strictly co-op, the puzzles can be fun to try and crack with others. I’ve got to say, I don’t like the sound of the tagged KS items. I’d prefer those to just be embedded in the world without any kind of reference but then, like you say, it’s good to know what things aren’t part of the puzzles. Ain’t nobody got time for red herrings. Thanks for the review, will get this wishlisted! Did you play The Witness Amanda? How did you fare with it? I liked The Witness! But it’s a contemplative and slow game so I never really “finished” it before I got distracted by something else shiny. I really liked Electron Dance’s video about it. Is there a non-spoilery explanation for that title?